Wolf ammunition is a great choice for economical high-volume shooting. 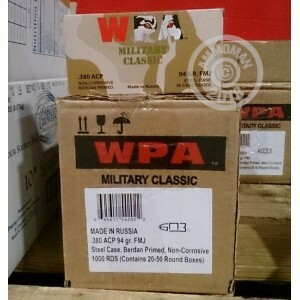 Manufactured in Russia, this case of 1,000 rounds offers great bulk savings for owners of .380 ACP firearms like the Ruger LCP, Bersa Thunder, and Walther PP. These cartridges use non-corrosive Berdan primers and a 94 grain bimetal jacketed bullet; not all indoor ranges permit bimetal ammunition due to its magnetic properties, so check with yours to make sure--or go to an outdoor range if you can. The non-reloadable steel cases in this ammo use a polymer coating to promote reliable feeding and ejection, and contribute significantly to the low cost of this ammo. Buy this case, or any of our other case-priced centerfire ammunition, to qualify for AmmoMan.com's free shipping promotion for orders over $99. It's a great deal that helps avid shooters keep their costs down and keeps them coming back to AmmoMan for more savings!